For the first time this holiday we opened the curtains to cloudy skies but the forecast was good for our planned day out to Vaxholm in the Stockholm archipelago. The island can either be reached by ferry or road as there is a bridge connecting the island to the mainland. Although it would have been more pleasant to approach the island by boat we opted to travel by metro and bus as the journey is included in the SL-Access travel card. To get there we took the metro to Tekniska Högskolan metro station on the Red Line and then transferred to Bus 670 which terminates in Vaxholm. The entire journey took approximately 50 minutes with the latter part of the bus journey being very scenic. The bus terminated on the waterfront near the ferry terminal and after picking up a map from the nearby tourist information office we set off on our way. As we were crossing the road we heard the hoot of a steamer approaching the quay so we sat on a bench for a few minutes to watch it come in and its passengers disembark. Vaxholm is located in the centre of the archipelago and is a hub for boat travel with numerous ferries calling at the island each day. 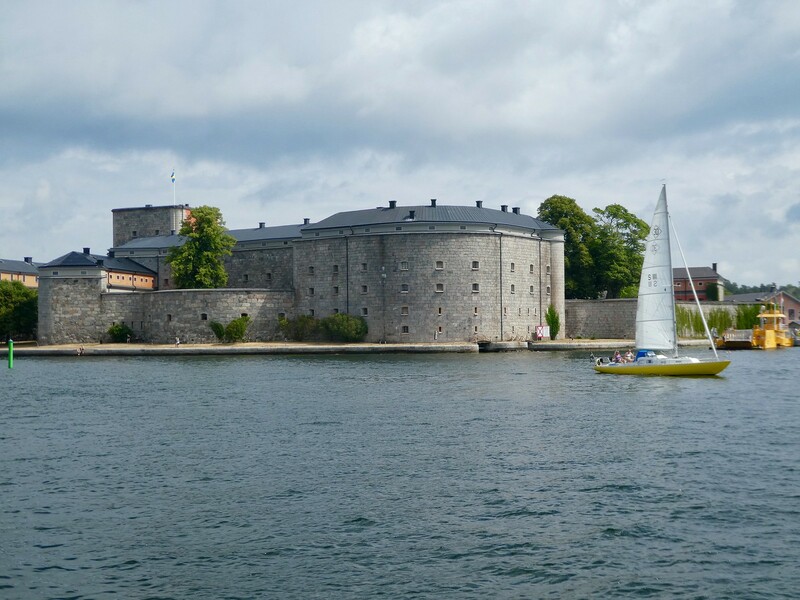 Near to the ferry terminal and located across a narrow channel stands the Vaxholm Fortress which was first built in 1544 to guard the island. A small ferry operates every 20 minutes for visitors wishing to explore the fortress and its museum. We wandered along the coastal path admiring some of the island’s well preserved wooden houses which were painted in candy coloured pastels. Each of them had neat cottage style gardens brimming with scented roses. There was a cafe marked on our map down a narrow lane and as we were looking for somewhere for lunch we went to investigate. 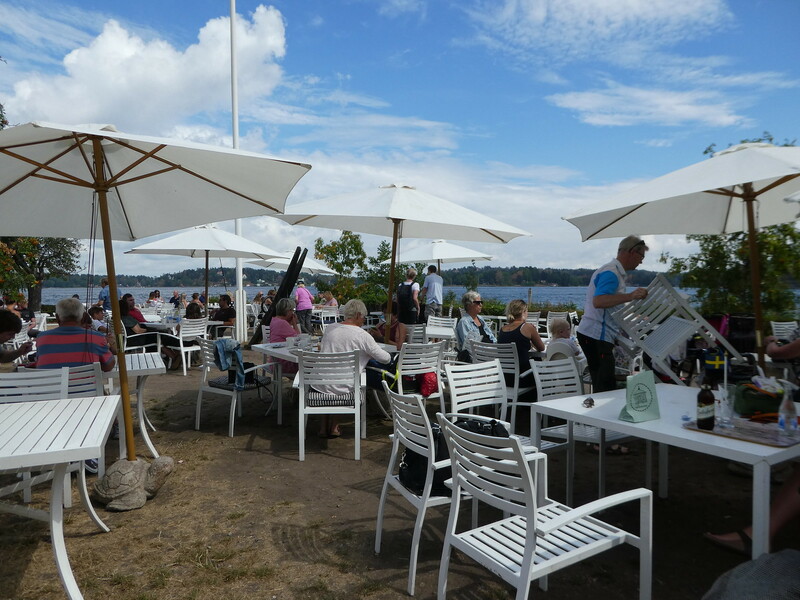 The Hembygdsgårds cafe is nestled in an idyllic location overlooking a small bay and seemed very popular. 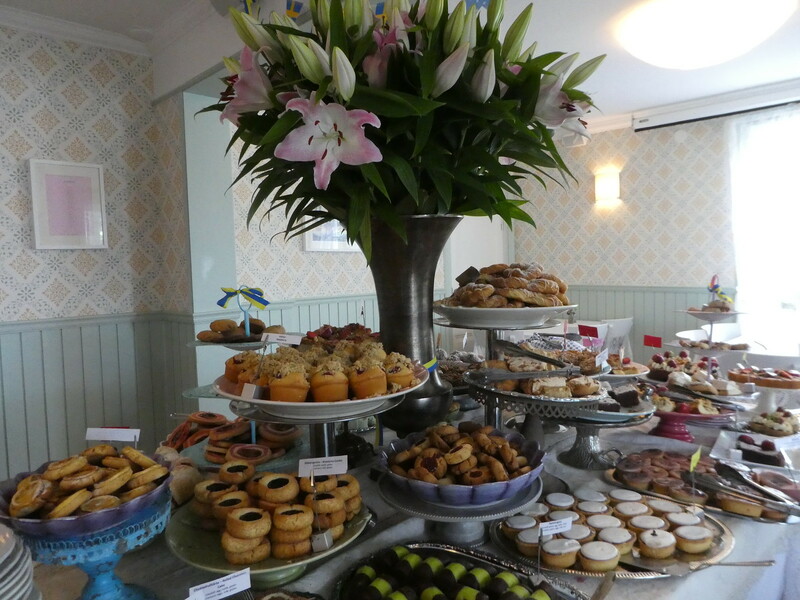 A long queue of customers were waiting to be served but as the large selection of cakes looked so tempting we decided it was worth waiting and being patient, even managed to get a table in the garden near the water’s edge. It was so relaxing sitting there feeling the gentle breeze and hearing the sounds of lapping water whilst indulging in tea and cakes. After enjoying our tea and cakes we continued our stroll through the small town passing fishing huts, small boats and more beautiful wooden houses. 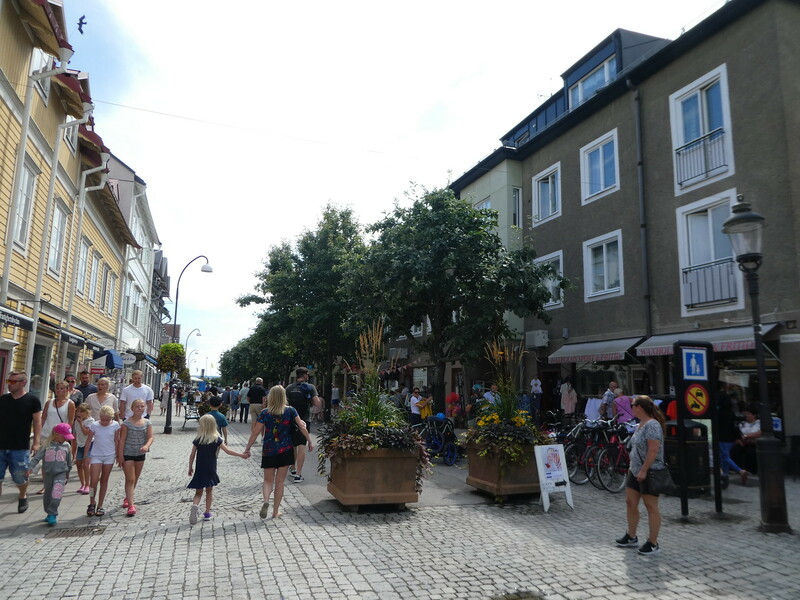 Our tour finally led us to the newer part of town back near the ferry pier where we found a pedestrianised street lined with small shops, cafes and restaurants. We didn’t have to wait very long for a bus back towards Stockholm and it was just as well we were getting off at its terminus as we both fell asleep for part of the journey. We returned to our accommodation in Solna and mid-evening set off again to Kungsträdgården for a stroll through the park. 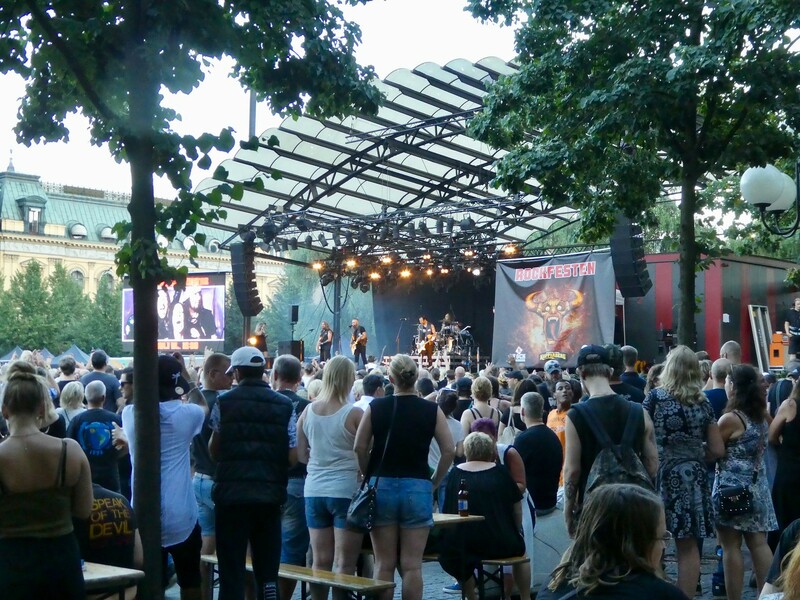 A free Rock Fest concert was taking place over two evenings at one end of the park and we managed to find a gap in the crowds to watch for a few minutes whilst a Swedish band took to the stage. There was a lively party atmosphere and the surrounding bars and cafes were overflowing with customers enjoying the music and warm evening temperature. Am from Holland, but live in the USA. Have toured through most of Europe, except for Scandinavia, Ireland, Portugal and Russia. So, this is interesting to me. Saw your like -thank you! How did you get to my url? Have a great week! Thank you for taking an interest in my Swedish posts. I’ve actually visited and written about most if the destinations in Europe you haven’t yet been to, so hopefully you might find some inspiration for future trips! I noticed your post in my WordPress Travel feed. Beautiful pictures. Looks a very tranquil spot! Thank you, the Stockholm archipelago is very tranquil but receives a lot of summer visitors. 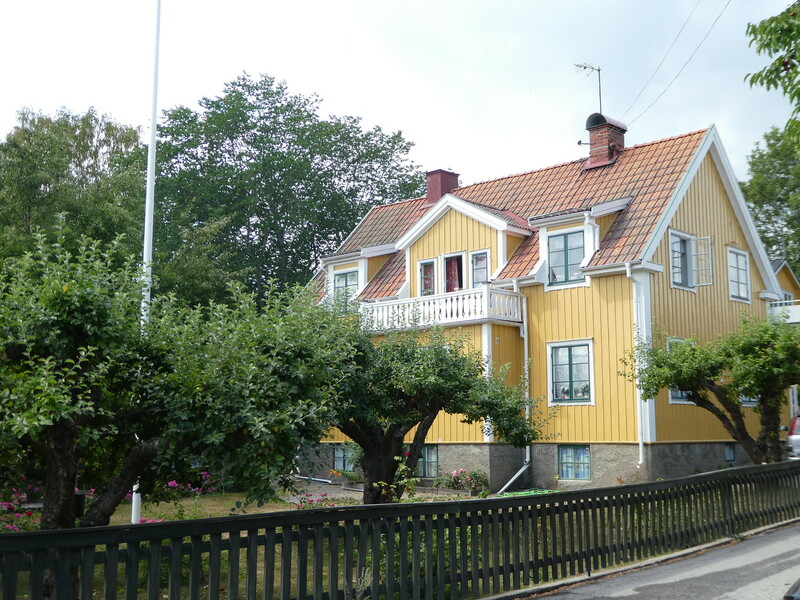 It was so lovely re-living my visit to Vaxholm about 7 odd years ago! I was showing my daughter the photographs (she was 11 then) and I was very happy to see that she remembered it!! It is such a lovely place and very swedish. I had my first Swedish fika experience there! 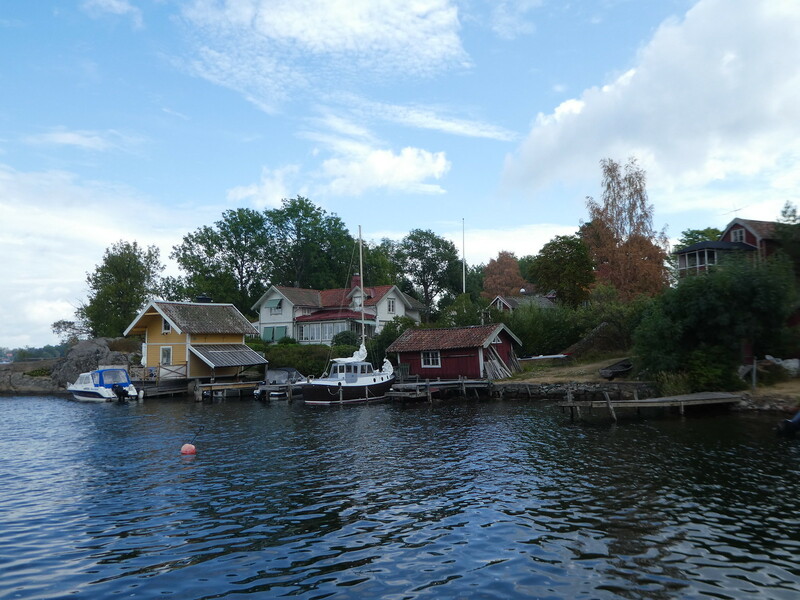 Thank you for your much appreciated thoughts on our day in Vaxholm it was so nice to take a trip out into the archipelago. It is a beautiful location that I will always remember! Lovely environment. Love the cobble stone roads and lanes in Europe. What caught my attention was the description of the climate as a warm evening. I’ve always imagined that country being so close to the pole would be freezing year around. I was surprised. This summer Northern Europe experienced an exceptionally hot summer. Another destination on my bucket-list. Great photos. Thank you. I do hope you manage to visit Stockholm sometime! Thanks again for your continued support of my Stockholm posts. it sounds like an absolutely charming place to visit. I love the fort…wow, so ancient and apparently in such good condition. those cakes look so delicious…..I’m drooling. 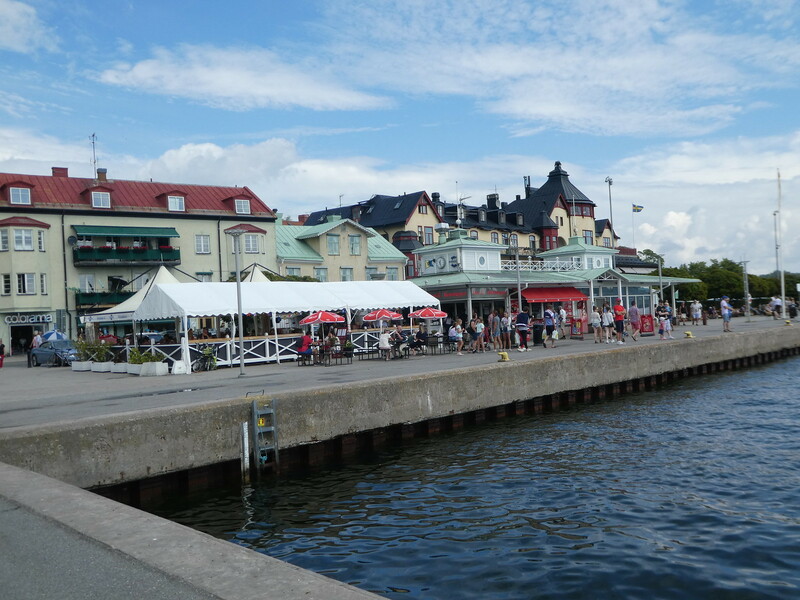 Thank you for your kind words Cindy, it’s good to read that you enjoyed this post on Vaxholm. Thank you, it’s so nice of you to comment! Are you traveling there now? I wouldn’t have thought it would be warm. I’m back home now and documenting my travels from late July. Thank you for taking an interest in my travels, it’s much appreciated. Thanks Jo. Yes, it’s always nice to combine a walk with tea and cakes isn’t it!